Blue backpackers was a lovely hostel in the perfect location. 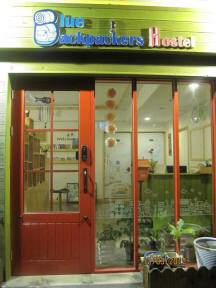 Very close to the subway station for easy exploring and Seomyeon nightlife for a walkable journey home. The staff were so lovely and friendly, they helped us whenever possible! The rooftop is lovely and I'm sure is great in the hotter months. The help yourself breakfast was simple but good enough - especially for the price! All in all, had a wonderful stay and would definitely stay again. Blue backpackers is in a great location. It’s a close walk to the subway, but still feels tucked away in a quiet neighborhood. The facilities are very nice and clean. It was quiet while we were there, but that is a positive for us. We really liked the free breakfast on the rooftop too. After my stay in Seoul in a hostel where I shared my room with 3 other girls it was nice to have an entire room to myself at this howtel. It was clean although you can see some water damage on the walls of the room. And I had my own bathroom and shower. I loved the fact that there's a common space to hang out and watch TV if you wanted and there are 2 computers available for you to use. A 10 to 13 min walk will get you to Seomyeon station and I wish I had stayed longer in Busan. Nice cozy hostel! Great breakfast selection! Overall really nice place. The common area was really nice. Nice showers I liked the location central Je Ju city. Stayed here on two different occasions and have recommended it to others. A very nice, friendly little place. We had a delayed flight for our layover so we arrived after 11pm and left at 6am, the owner stayed up to let us in and then helped us to book a large taxi the next day to fit in our bikes. Great service, definitely recommend! Friendly staff. Clean and comfortable. Close to the main bus station. A little lacking in atmosphere. First of all the staff are lovely and were very helpful throughout my stay. Otherwise the hostel was a little disappointing. The kitchen and shower areas were a bit grubby and there was no real atmosphere. Only 2 people including myself on the second night. Central location was useful to get everywhere but the metro is so easy that it might be best to stay near a social hub and travel to the tourist sites.